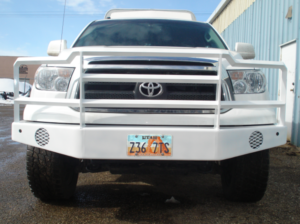 Custom bumpers made to order for any make or model of truck. Check out our large selection of custom models, find something you like, and we can make one for your rig. Aluminum or steel. Custom headache racks, tool boxes, running boards... if you can think of it we can custom make it for your truck. Aluminum or steel. 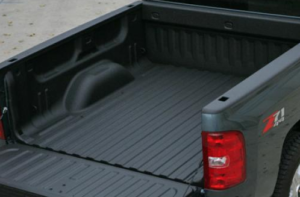 We use a versatile poly coating, for bed liners, lined rocker panels, toolboxes and more... Poly spray coating works well as a durable flooring for areas such as garages, workshops, stalls, or trailer floors. Custom bumpers and headache racks are just the beginning. If you have a custom welding job that needs to be done, we can take care of you. Learn more about our custom welding service. Best part is that we ship anywhere and offer a quick turn around time on all orders. Volume orders welcome. 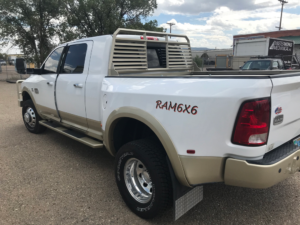 Thinking about a new headache rack, bumper or need some custom welding done? Contact us or give us a call: 970-824-2423. We are happy to discuss the details of your project.